If you create Visio documents with lots of pages, you probably like to quickly flip through all of them to check for visual consistency. 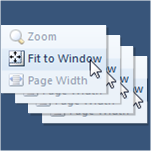 But if each page has been zoomed or panned, it can be frustrating to have to click Fit to Window for each page. But with a little macro code, you can make your life a lot easier! Arno Nel has published links to a really cool set of Visio drawings that relate to Microsoft SharePoint on his blog: Arno Nel 2.0 – The Information Worker. The diagrams illustrate models, scenarios, and flowcharts for planning, designing and deploying SharePoint installations. Yet another newsgroup post caught my eye today. I’m not sure if I answered the guy’s actual question, but I had fun creating this example anyway. Today’s sample shows you how to create a table of contents. 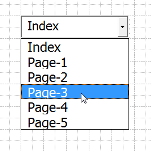 This particular version lists the pages in a Visio document in a drop-down combo box that sits on a Visio page. Just select an item from the list, and Voila! You are sent to the corresponding page in the document!